Fustat (Arabic: الفسطاط‎ al-Fusţāţ, Coptic: ⲫⲩⲥⲧⲁⲧⲱⲛ), also Fostat, Al Fustat, Misr al-Fustat and Fustat-Misr, was the first capital of Egypt under Muslim rule. It was built by the Muslim general 'Amr ibn al-'As immediately after the Muslim conquest of Egypt in AD 641, and featured the Mosque of Amr, the first mosque built in Egypt and in all of Africa. The city reached its peak in the 12th century, with a population of approximately 200,000. It was the centre of administrative power in Egypt, until it was ordered burnt in 1168 by its own vizier, Shawar, to keep its wealth out of the hands of the invading Crusaders. The remains of the city were eventually absorbed by nearby Cairo, which had been built to the north of Fustat in 969 when the Fatimids conquered the region and created a new city as a royal enclosure for the Caliph. The area fell into disrepair for hundreds of years and was used as a rubbish dump. Fustat was the capital of Egypt for approximately 500 years. After the city's founding in 641, its authority was uninterrupted until 750, when the Abbasid dynasty staged a revolt against the Umayyads. This conflict was focused not in Egypt, but elsewhere in the Arab world. When the Abbasids gained power, they moved various capitals to more controllable areas. They had established the centre of their caliphate in Baghdad, moving the capital from its previous Umayyad location at Damascus. Similar moves were made throughout the new dynasty. In Egypt, they moved the capital from Fustat slightly north to the Abbasid city of al-Askar, which remained the capital until 868. When the Tulunid dynasty took control in 868, the Egyptian capital moved briefly to another nearby northern city, Al-Qatta'i. This lasted only until 905, when Al-Qatta'i was destroyed and the capital was returned to Fustat. The city again lost its status as capital city when its own vizier, Shawar, ordered its burning in 1168. The capital of Egypt was ultimately moved to Cairo. According to legend, the location of Fustat was chosen by a bird: A dove laid an egg in the tent of 'Amr ibn al-'As (585–664), the Muslim conqueror of Egypt, just before he was to march against Alexandria in 641. His camp at that time was just north of the Roman fortress of Babylon. Amr declared the dove's nest as a sign from God, and the tent was left untouched as he and his troops went off to battle. When they returned victorious, Amr told his soldiers to pitch their tents around his, giving his new capital city its name, Miṣr al-Fusṭāṭ, or Fusṭāṭ Miṣr, popularly translated as "City of the tents", though this is not an exact translation. The word Miṣr was an ancient Semitic root designating Egypt, but in Arabic also has the meaning of a large city or metropolis (or, as a verb, "to civilize"), so the name Miṣr al-Fusṭāṭ could mean "Metropolis of the Tent". Fusṭāṭ Miṣr would mean "The Pavilion of Egypt". Egyptians to this day call Cairo "Miṣr", or, colloquially, Maṣr, even though this is properly the name of the whole country of Egypt. The country's first mosque, the Mosque of Amr, was later built in 642 on the same site of the commander's tent. The early population of the city was composed almost entirely of soldiers and their families, and the layout of the city was similar to that of a garrison. Amr intended for Fustat to serve as a base from which to conquer North Africa, as well as to launch further campaigns against Byzantium. It remained the primary base for Arab expansion in Africa until Qayrawan was founded in Tunisia in 670. Fustat developed as a series of tribal areas, khittas, around the central mosque and administrative buildings. The majority of the settlers came from Yemen, with the next largest grouping from western Arabia, along with some Jews and Roman mercenaries. Arabic was generally the primary spoken dialect in Egypt, and was the language of written communication. Coptic was still spoken in Fustat in the 8th century. Fustat was the centre of power in Egypt under the Umayyad dynasty, which had started with the rule of Muawiyah I, and headed the Islamic caliphate from 660 to 750. However, Egypt was considered only a province of larger powers, and was ruled by governors who were appointed from other Muslim centres such as Damascus, Medina, and Baghdad. Fustat was a major city, and in the 9th century, it had a population of approximately 120,000. But when General Gawhar of the Tunisian-based Fatimids captured the region, this launched a new era when Egypt was the centre of its own power. Gawhar founded a new city just north of Fustat on August 8, 969, naming it Al Qahira (Cairo), and in 971, the Fatimid Caliph al-Mo'ezz moved his court from al-Mansuriya in Tunisia to Al Qahira. But Cairo was not intended as a center of government at the time—it was used primarily as the royal enclosure for the Caliph and his court and army, while Fustat remained the capital in terms of economic and administrative power. The city thrived and grew, and in 987, the geographer Ibn Hawkal wrote that al-Fustat was approximately one third the size of Baghdad. By 1168, it had a population of 200,000. The city was known for its prosperity, with shaded streets, gardens, and markets. It contained high-rise residential buildings, some seven storeys tall, which could reportedly accommodate hundreds of people. Al-Muqaddasi in the 10th century described them as Minarets, while Nasir Khusraw in the early 11th century described some of them rising up to 14 stories, with roof gardens on the top storey complete with ox-drawn water wheels for irrigation. The Persian traveller, Nasir-i-Khusron, wrote of the exotic and beautiful wares in the Fustat markets: iridescent pottery, crystal, and many fruits and flowers, even during the winter months. 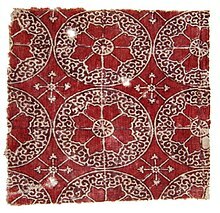 From 975 to 1075, Fustat was a major production centre for Islamic art and ceramics, and one of the wealthiest cities in the world. One report stated that it paid taxes that were equivalent to US$150,000 per day, to the administration of Caliph Mo'ezz. Modern archaeological digs have turned up trade artefacts from as far away as Spain, China, and Vietnam. Excavations have also revealed intricate house and street plans; a basic unit consisted of rooms built around a central courtyard, with an arcade of arches on one side of the courtyard being the principal means of access. In the mid-12th century, the caliph of Egypt was the teenager Athid, but his position was primarily ceremonial. The true power in Egypt was that of the vizier, Shawar. He had been involved in extensive political intrigue for years, working to repel the advances of both the Christian Crusaders, and the forces of the Nur al-Din from Syria. Shawar managed this by constantly shifting alliances between the two, playing them against each other, and in effect keeping them in a stalemate where neither army could successfully attack Egypt without being blocked by the other. However, in 1168, the Christian King Amalric I of Jerusalem, who had been trying for years to launch a successful attack on Egypt in order to expand the Crusader territories, had finally achieved a certain amount of success. He and his army entered Egypt, sacked the city of Bilbeis, slaughtered nearly all of its inhabitants, and then continued on towards Fustat. Amalric and his troops camped just south of the city, and then sent a message to the young Egyptian caliph Athid, only 18 years old, to surrender the city or suffer the same fate as Bilbeis. After the destruction of Fustat, the Syrian forces arrived and successfully repelled Amalric's forces. Then with the Christians gone, the Syrians were able to conquer Egypt themselves. The untrustworthy Shawar was put to death, and the reign of the Fatimids was effectively over. The Syrian general Shirkuh was placed in power, but died due to ill health just a few months later, after which his nephew Saladin became vizier of Egypt on March 2, 1169, launching the Ayyubid dynasty. With Fustat no more than a dying suburb, the center of government moved permanently to nearby Cairo. Saladin later attempted to unite Cairo and Fustat into one city by enclosing them in massive walls, although this proved to be largely unsuccessful. In 1166 Maimonides went to Egypt and settled in Fustat, where he gained much renown as a physician, practising in the family of Saladin and in that of his vizier Ḳaḍi al-Faḍil al-Baisami, and Saladin's successors. The title Ra'is al-Umma or al-Millah (Head of the Nation or of the Faith), was bestowed upon him. In Fustat, he wrote his Mishneh Torah (1180) and The Guide for the Perplexed. Some of his writings were later discovered among the manuscript fragments in the geniza (storeroom) of the Ben Ezra Synagogue, located in Fustat. While the Mamluks were in power from the 13th century to the 16th century, the area of Fustat was used as a rubbish dump, though it still maintained a population of thousands, with the primary crafts being those of pottery and trash-collecting. The layers of garbage accumulated over hundreds of years, and gradually the population decreased, leaving what had once been a thriving city as an effective wasteland. Today, little remains of the grandeur of the old city. The three capitals, Fustat, Al-Askar and Al-Qatta'i were absorbed into the growing city of Cairo. Some of the old buildings remain visible in the region known as "Old Cairo", but much of the rest has fallen into disrepair, overgrown with weeds or used as garbage dumps. The oldest-remaining building from the area is probably the Mosque of Ibn Tulun, from the 9th century, which was built while the capital was in Al-Qatta'i. The first mosque ever built in Egypt (and by extension, the first mosque built in Africa), the Mosque of Amr, is still in use, but has been extensively rebuilt over the centuries, and nothing remains of the original structure. In February 2017 the National Museum of Egyptian Civilisation was inaugurated on a site adjacent to the mosque. It is believed that further archaeological digs could yield substantial rewards, considering that the remains of the original city are still preserved under hundreds of years of rubbish. Some archaeological excavations have taken place, the paths of streets are still visible, and some buildings have been partially reconstructed to waist-height. But the site is difficult and dangerous to access because of the nearby slums. However, some artifacts that have been recovered so far can be seen in Cairo's Museum of Islamic Art. ^ AlSayyad, Nezar (2011). Cairo. Harvard University Press. p. 75. ISBN 978-0674047860. ^ Since it lacks the article on the word Miṣr it would not be "The Pavilion of the Metropolis". ^ Worman, Ernest (October 1905). "Notes on the Jews in Fustāt from Cambridge Genizah Documents". Jewish Quarterly Review. pp. 1–39. ^ Lapidus, p. 52. "In general, Arabic became the language of written communication in administration, literature, and religion. Arabic also became the primary spoken dialect in the western parts of the Middle East – Egypt, Syria, Mesopotamia and Iraq – where languages close to Arabic, such as Aramaic, were already spoken. The spread of Arabic was faster than the diffusion of Islam, but this is not to say that the process was rapid or complete. For example, Coptic was still spoken in Fustat in the 8th century." ^ Kjeilin, Tore. "Fustat". Encyclopaedia of the Orient. Retrieved 2007-08-13. ^ Beeson, Irene (September–October 1969). "Cairo, a Millennial". Saudi Aramco World. pp. 24, 26–30. Archived from the original on 2007-09-30. Retrieved 2007-08-09. ^ Doris Behrens-Abouseif (1992). Islamic Architecture in Cairo. Brill Publishers. p. 6. ISBN 90-04-09626-4. ^ Barghusen, Joan D.; Moulder, Bob (2001). Daily Life in Ancient and Modern Cairo. Twenty-First Century Books. p. 11. ISBN 0-8225-3221-2. ^ a b Tyerman, Christopher. God's War: a new history of the Crusades. Belknap. pp. 347–349. ISBN 978-0-674-02387-1. ^ a b Zayn Bilkadi (January–February 1995). "The Oil Weapons". Saudi Aramco World. pp. 20–27. Archived from the original on 2011-06-09. Retrieved 2007-08-09. ^ Hoffman, Edward (2008). The Wisdom of Maimonides. Boston: Shambhala Productions. pp. 163–165. ISBN 978-1-590-30517-1. ^ Kessler, Adam T. (2012). Song Blue and White Porcelain on the Silk Road. Leiden: Koninklijke Brill. p. 431. ISBN 978-90-04-21859-8. ^ Alison Gascoigne. 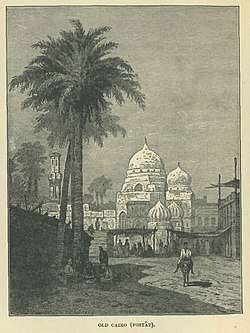 "Islamic Cairo". egyptvoyager.com. Retrieved 2007-08-13. David, Rosalie (2000). The Experience of Ancient Egypt. London; New York: Routledge. ISBN 0-415-03263-6. Petersen, Andrew (1999). Dictionary of Islamic Architecture. London; New York: Routledge. ISBN 0-415-21332-0. Yeomans, Richard (2006). The Art and Architecture of Islamic Cairo. Garnet & Ithaca Press. ISBN 1-85964-154-7. Williams, Caroline (2002). Islamic Monuments in Cairo: The Practical Guide. American University in Cairo Press. ISBN 977-424-695-0. Wikimedia Commons has media related to Fustat. Bacharach, Jere L. (2004). Fustat Finds: Beads, Coins, Medical Instruments, Textiles, and Other Artifacts from the Awad Collection. American University in Cairo Press. ISBN 977-424-393-5. Barekeet, Elinoar (1999). Fustat on the Nile: The Jewish Elite in Medieval Egypt. BRILL. ISBN 90-04-10168-3. Kubiak, Wladyslaw (1987). Al-Fusṭāṭ, its foundation and early urban development. Cairo, Egypt: American University in Cairo Press. ISBN 977-424-168-1. Scanlon, George T. (1974). "The Pits of Fustat: Problems of Chronology". The Journal of Egyptian Archaeology. The Journal of Egyptian Archaeology, Vol. 60. 60: 60–78. doi:10.2307/3856171. JSTOR 3856171. Scanlon, George T.; Pinder-Wilson, Ralph (2001). Fustat Glass of the Early Islamic Period: Finds Excavated by the American Research Center in Egypt, 1964–1980. Altajir World of Islam Trust. ISBN 1-901435-07-5. Toler,Pamela D. 2016. "In Fragments from Fustat, Glimpses of a Cosmopolitan Old Cairo." Aramco World. Volume 67 (1), pages 4–9. http://www.worldcat.org/oclc/895830331.